When you're applying to a job that has lots of competition, how do you set yourself apart? As the old saying goes, you only get one first impression - better make it good. Both branding and neuroscience tell us that people ACT how they FEEL. If your goal is to get someone to hire you, they need to trust that you could do the job, feel confident in your experience, appreciate how easy it is to figure out whether you're a good candidate, respect your preparation, admire your presentation, and feel connected to your style. My goal is to position you with a compelling narrative and a visually striking design that reflects your unique experience and personality, so that your potential employer's first impression is impressed, intrigued, and excited to bring you in for the interview. This is so much more than "making your resume pretty." This is about communicating who you are in a single, powerful snapshot. Professional Positioning Coaching (50mins): we'll work together to create an authentic narrative that positions you perfectly for the jobs to which you're applying. Resume Copyediting (50mins): I'll take your existing resume and update the copy in three ways. First, I'll update the existing copy for consistency and a conversational tone that matches your own. Next, I'll create a Professional Summary page. This page can be used on its own, or as the intro page in a longer resume. This format ensures that your potential employer gets all of the relevant information up front, without having to hunt. Lastly, if there is room on the page, I will include some personality sections that help you make a genuine human connection with the hiring person. Resume Design & Copy Review (30mins): We'll come together for a short session and review your sparkly new resume, either in person or via Skype. This is your opportunity to tell me what you love about it, what you hate about it, and what just needs a tweak or two. Resume Design + Copy Edits (30mins): Quick like lightening, I'll update your resume to the specifications you communicated during our review. Final Review + Canva Tutorial (50mins): In our final session, we'll review the final resume. Once you've approved it, I'll show you the ropes on Canva, so that you can make any future design or copy edits on your own (see why below!). Not sure exactly what you need? Let's talk about it! 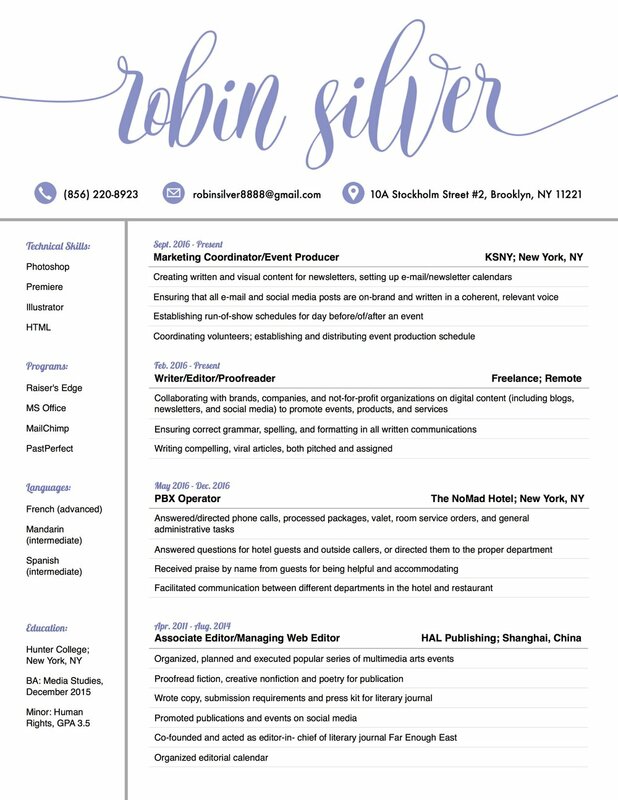 Here are just a few recent Resume and Cover Letter Designs, to give you a feel for my style.